Beautiful Ruby Ring by Stanton Color. 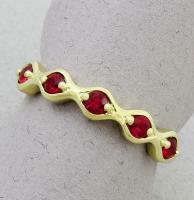 Band style ring features 5 rich, red Rubies .63ct. Rubies, like sapphires, come from the corundum mineral family. Only red corundum is called ruby; other colors are considered sapphires. When the stones appear pink, gemologists prefer to call them "pink rubies" instead of "pink sapphires" because the ruby is more valuable. A ruby's color is the biggest factor in determining its value: The deeper its red hue, the more it's worth. Ruby is the traditional birthstone for July. This one of a kind ring is available in a size 7 only.